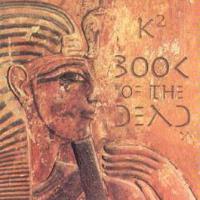 With an Egyptian on the cover, you'd expect something from The Bangles. However, this is much more progressive in nature. The music takes us back one decade further than "Walk Like An Egyptian" to the days when rock and classical music frequently frolicked with one another. The book is a dead ringer for classic Genesis gems like "Foxtrot" and "Selling England by the Pound". If you think this too brash and you're quick to turn your nose up at such a declaration, I dare you to check out the album. I doubt you'll disregard it as a new landmark in the genre. This isn't some shoddy undertaking that's slapped together with loose binding. The concept seems solid, but more importantly, it is played by some serious and well-known talent. Allan Holdsworth provides the guitars and as usual, they're staggering. Ryo Okumoto participates with piano and moog. He's the earth, wind, and the fire, giving the music a down-home and otherworldly feeling both at the same time. The late great Shaun Guerin gives us vocals strangely similar to Peter Gabriel. Last and less known, but certainly not the least, Ken Jaquess is the brains behind all of its brawn. There is little flair in the music, but what you will find gets more enchanting with every listen. These musicians make sure that even the tiniest note makes a long-lasting impression. In addition to writing, arranging, and producing the music, Ken plays multiple instruments, which include bass, keyboards, and a 10 string acoustic. Ken's bass playing convincingly doubles Dave Meros. While Ken and Shaun seems to be doing spot-on impressions, Ryo's playing is much different than what we've come to expect from him. It's certainly more proggy than his solo effort "Coming Through", but it doesn't sound like anything he's done in the past. While the music keeps to the tradition of classic Genesis, it has the sense and wit of Spock's Beard. Not to mention, there are a few moments, though rare, that have a touch of the Flower King's magic. I reference the all-time greats, because there is something special about this release. There are elements that are very familiar to us, but it's unique in how he fuses it all together. It is never overdone and nowhere near overcomplicated. Ken never seems to add an extraneous instrumentation just for the sake of it. Yet, the music still comes off slightly convoluted. Even so, it blends well once it comes together. Many of our favorite flavors are found in this mix. It goes down smooth and once inside it is like a burst of thirst-quenching pleasure. Make no bones about it, this song is classic Genesis all the way. Shaun Guerin is Peter Gabriel's long lost twin. The opener comes to us in epic form. Actually, the majority of the album is spent on this track as it takes up 23 minutes. Fortunately, you won't feel like you're wasting your time here. The violins trading off with Holdworth's guitars are something to behold. Ryo's keyboards sweep the ground like a tornado rampaging through the heartland of Kansas (pun intended). The end of the epic almost seems like it is the end of the album. Fortunately, there is much more to follow. It's convenient to look this chapter over later if you've got the time and need a refresher. The keyboards keep pace with Shaun's brisk voice. He's singing in an odd key, but it works just the same. In some ways this sounds a lot like a Spock's Beard tune, but not in the way you'd expect. While the keyboards sound more like Tony Banks, Ken Jaquess really seems to replicate Dave Meros here. The influences of Genesis, Kansas, and Spock's Beard make another arrival. This time they all intermingle in one piece. The keyboards bring in a little ELP while the violin is reminiscent of Kerry Livgren. This song is hard to describe. It has the polished production and arrangement of a modern day song, but it has the feel of a golden oldie. Without knowing any of its back story, you'd swear this was a remastered classic. It's separated into several sequences that are sharpened with an airbrush. You won't hear where one breaks and the next one begins. This is like a fantasy pin-up and it's one of the most impressive songs on the album. This appears to be all Ken as he is by himself in a brief guitar solo. At some point, it seems like he switches instruments. It's hard to tell if this is acoustic, electric, or bass, or a combination of the three. The keyboards wash over the music like a light rain. It's no more than a spritz and a sprinkle. The initial theme makes its homecoming return. While it shares many lines with the opener, it is arranged in a slightly different manner, and the finish is sure to be unforeseen. This one seems to have slightly more energy as well. The themes are practical and useful. My only complaint is that the same themes seem to dominate the album. Luckily, Ken does a good job of introducing various tweaks and twists in order to keep the music intriguing. Like the first, if you want a glimpse of the album, you can come straight to this chapter. This section is much shorter, so it just depends on how much time you have to commit. Whether you taste a track by itself, spend your time with the epic, or listen to it from start to finish, I suspect you'll want to revisit this album often. K2 is a difficult one to shutoff and it's definitely worthy of your attention.